Rush Manchester is now open for business, take advantage of 50% off! RUSH Manchester is now open! 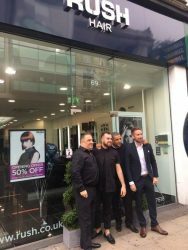 Toby Parrett, the salon manager, was joined by Co-Founder Stell Andrew and Operations director George Phouli to cut the ribbon on Saturday 1st October. The grand opening took place at 69 Deansgate, M3 2BW. Clients made the most of the new opening offers, cupcakes, bubbly, and goodie bags. The newest salon is in the heart of the city centre, located between department stores and trendy bars. Not far from the salon is the iconic Old Trafford Stadium. Whilst inside the salon, customers found a shiny modern interior and a luxurious retail range. More importantly, each and every one of our talented stylists made each client feel at home. Backed by RUSH’s award winning team, our expertly trained stylists are passionate about hair and are keen to help maintain healthy, beautiful hair. Whether you’re looking to refresh your hair with some colour or have a bouncy blow-dry, RUSH brings you beautiful hair at affordable prices.